OECD member countries still have sizable manufacturing sectors, but they are shifting toward advanced manufacturing, which uses technologies that tend to be less energy-intensive. As more economic activity shifts from lower-skilled manufacturing to services and higher-skilled advanced manufacturing, additional economic activity can be generated without requiring as much electricity use. 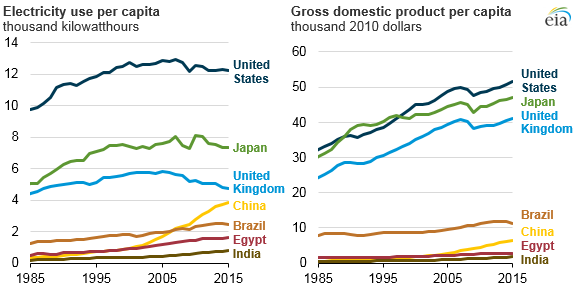 Some non-OECD member countries, such as China, India, Brazil, and Egypt, have rapidly growing economies, often generated by a large or growing manufacturing sector. However, these economies use technologies that are less efficient and have lower-skilled labor relative to OECD countries, which requires more energy and more electricity usage to generate goods and services. National electricity use among OECD member countries has generally remained flat in recent years, and in EIA’s International Energy Outlook 2017 (IEO2017), electricity use from these countries is projected to grow modestly. Total electricity use by non-OECD member countries, however, surpassed electricity use by OECD members in 2011, and IEO2017 projects it to continue growing. 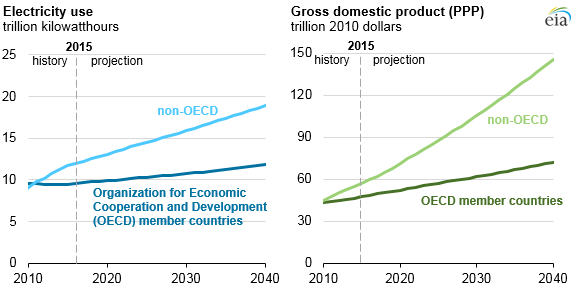 The amount of electricity needed in the future will largely depend on how fast non-OECD economies grow and what type of activities make up that economic growth. For both groups, IEO2017 projects electricity growth to remain lower than the rate of economic growth. In the IEO2017 Reference case, among OECD member countries, gross domestic product (GDP) increases by 1.7% per year, and electricity use increases by 0.9% per year between 2015 and 2040. 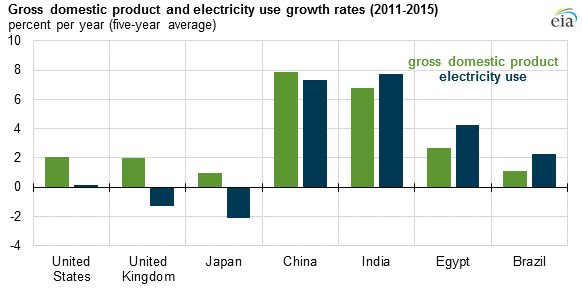 In non-OECD countries, GDP increases by 3.8% per year, and electricity use increases by 2.0% per year over the same period. Note: Gross domestic product comparisons based on purchasing power parity (PPP).